Player by Player Guide for the 2018 US Open – CLICK HERE! Here we are: the second major of the year, the US Open. Known historically as one of the hardest challenges in golf, it is perhaps fitting that 2018’s host course is the Shinnecock Hills in Long Island, New York – renowned for being an extremely tough test. The last US Open held here in 2004 was won by Retief Goosen with a score of -4 and he won by two strokes. The US Open crew will be eager to make sure this year is a really tough examination of golf. Last year at Erin Hills the winning score was -16, eight shots better than the previous best. They definitely won’t be happy with that as they pride themselves on making it extremely tough for golfers. The US Open is specifically played at courses that offer unique tests, and as such there has been a number of shock winners of the event; the likes of Webb Simpson in 2012 and Lucas Glover in 2009 were hardly household names at the time, but they are tidy players who can avoid trouble rather than their wayward, big hitting rivals. We should also add, by way of caveat, that Jordan Spieth, Dustin Johnson and Rory McIlroy have also won this tournament. This will be the 5th time the US Open has been held at Shinnecock Hills. Founded way back in 1891, it is one of the oldest golf courses in the USA and is also very private. This will arguably be the toughest test of golf the players will face all season long. The one thing that will make life a touch easier is the fact great weather is forecast; 20 degrees celcius and better for the week so if the wind gives way the course will be as scorable as it possibly can be. The fairways have been widened here; not so sure that was such a great move personally but time will tell. The average fairway width in 2004 was 24 yards, this year it will be 41 yards, huge difference and more forgiving. We all remember 2004 and the carnage on the 7th green where balls wouldn’t stay still. They made a huge mistake rolling the greens the night before that year so they will be more cautious this time around. The yardage has increased about 500 yards from 2004 which is a plus but the way the players are hitting it these days it won’t make much difference. Note: All selections are advised Each-Way. 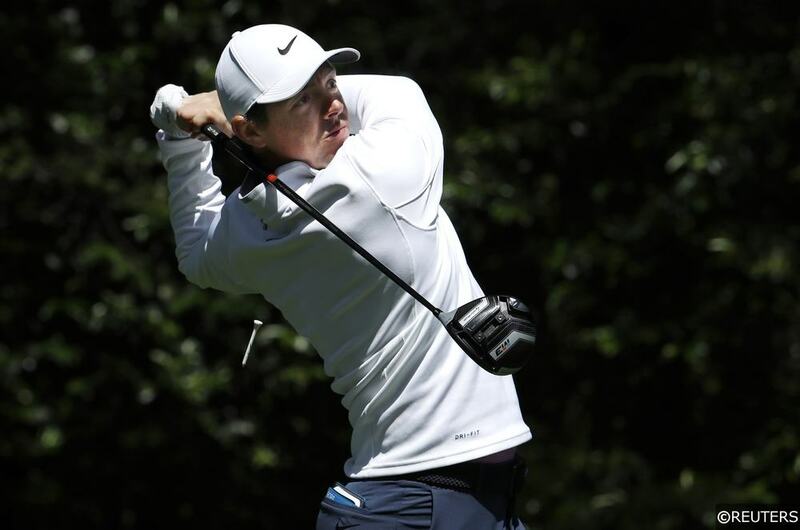 Despite a double bogey on his final hole, Rory set a US Open 36 hole scoring record on his way to a scintillating win for his first major win in 2011. He had a disappointing year in 2017 due to a rib injury but since then he has got married and is now injury free so he is in a good place. His problem this year has been his putting which to put it mildly has been extremely poor. If he can get the putter going for the US Open, he will WIN! He has been in contention nearly every week he plays at the moment but when it comes to Sunday, the putter has gone missing. He has a chance to put that right this week. Dominated the Fort Worth Invitational just a couple of weeks ago in impressive fashion. One thing I noticed that week is the strength of his putting game which has so often let him down. Justin is the best player in the world tee to green; straight and long off the tee, accurate with his irons and a dynamite wedge game to boot. He won the 2013 US Open and is not afraid of a dog fight. He was 2nd at Augusta twice so has a real major pedigree and if he is in contention on Sunday, and I think he will be, he is one to be for, not against. If he putts well at Shinnecock Hills, he has an outstanding chance. He may have had two wrist dislocations in two months but this man is a serious baller! He chased home the unstoppable Justin Rose in the Fort Worth Invitational and did absolutely nothing wrong on the Sunday, posting a very low score in the process. His game is in serious shape heading into US Open week and the length of the course should suit him as he hits it a long way. He won the US Open last year so arrives here as the defending champion. Winning it back to back is a huge ask but he is one of our favourites on paper. Ticks all the boxes so fingers crossed for a big week. We are expecting a massive week for this Swede at Shinnecock Hills this week and we feel he may be under-estimated by the bookmakers. Tied 6th in the Open Championship last year, this course will be right up his street. He excels on coastal tracks. He has a very low left to right ball flight that looks funny to the eye but it works for him! Now a nine-time European Tour winner, he has yet to make his mark on the PGA Tour or a Major Championship but it looks like his turn is just around the corner. He arrives here in good heart after a solid T3 finish at Wentworth and is one of our leading contenders this week. Italian pocket rocket who won the BMW PGA Championship at Wentworth a couple of weeks ago, the flagship tournament on the Eastern side of the Atlantic. I am not so sure this course is ideal for Francesco who prefers a tight, short, narrow layout with small greens where accuracy off the tee and accuracy approaching the greens are of the utmost importance. He would be one of the shorter hitters on tour which might hinder him but he is too big a price for a player in such great form at present.